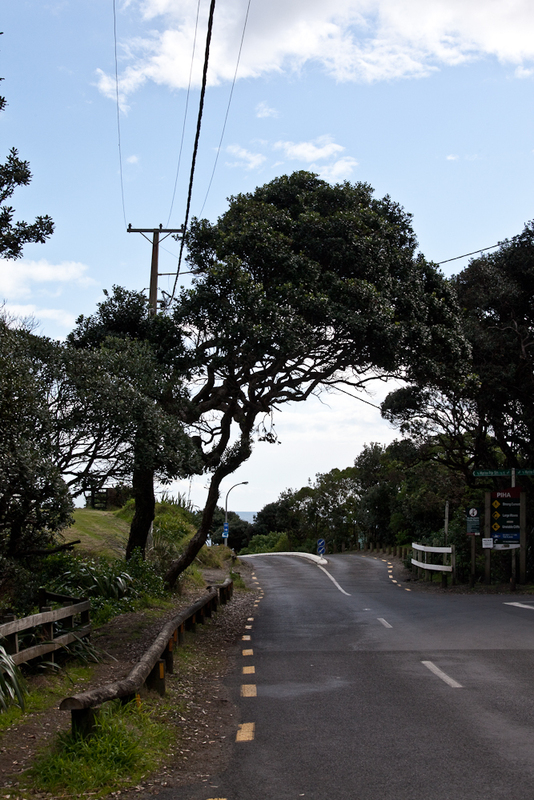 There is a Pohutukawa situated on Beach Valley Road in Piha that has been the centre of some recent attention. A without notice resource consent has been granted for one of its limbs to be removed. And its complete removal is planned. The episode raises some very important issues. What involvement should local communities have in decisions affecting iconic trees on public land? The tree itself is not an iconic example of its species. It has been battered by coastal winds and sweeps heavily away from the beach. But Piha is renowned for its pohutukawa. They are everywhere. They are iconic and are quite particular to Piha. Many of them are on public land. I cannot think of anywhere where they are more prominent. One of the reforms of Super City was the establishment of so called Council Controlled Organisations. These entities have considerable power over large parts of the city. For instance Auckland Transport has control over not only the roads, but also road reserves. The Pohutukawa, being typical Pohutukawa, tend to grow randomly. A network focussed transport efficiency approach would have them all felled. But the mere suggestion that this should occur would have residents in Piha and the rest of the Ranges rioting in the streets. So the fate of this particular pohutukawa has attracted a lot of recent attention. A resource consent was granted to cut one of its two branches. The intent appears to be to eventually have it removed. The resource consent was not advertised and as far as I am aware no one outside of Auckland Transport was formally notified that it was being sought. Should Auckland Council’s permission have been sought? The first thing to do in working this out is to check the law which unfortunately is spread amongst various different pieces of legislation. The lack of a codified law of local government makes the process somewhat hit and miss. Following is my analysis. As far as I am aware I have referred to all relevant pieces of legislation. Auckland Transport’s purpose is to “contribute to an effective and efficient land transport system to support Auckland’s social, economic, environmental, and cultural well-being.” Obviously the drafters of this provision thought that an effective and efficient transport system would make the city a better place. But concentrating on effectiveness and efficiency can mean that beauty and a quality environment are less important considerations. Its operating principles focus on financial viability and efficiency and effectiveness, again principles that relegate environmental protection to a secondary position. It has power to “manage and control the Auckland transport system”. Under section 316(1) of the Local Government Act 1974 roads were vested in the council of the district in which they were situated. Under section 35(1)(d) of the Local Governemnt (Tamaki Makaurau Reorganisation) Act 2009 each Council’s assets vested in the Auckland Council. Power was established under sections 36 and 39 of that Act to further vest assets into entities other than Auckland Council by way of regulation. And finally under Regulation 12 of the Local Government (Tamaki Makaurau Reorganisation) Council-controlled Organisations Vesting Order 2010 various assets vested in Auckland Transport. But it is clear that roads did not. Under R 12(4)(a) “the following do not vest in or otherwise attach to Auckland Transport … any road within the district of each existing local authority”. I might be wrong but it appears clear to me that roads including road reserves remain in the ownership of Auckland Council. If so then as the owner of the tree Auckland Council is clearly an affected person and notification should have been given to it of the application. Besides a resource consent does not equate to permission to exercise rights over something that another entity owns. Clearly the intent of the legislation was to give Auckland Transport full power over Auckland’s transport system. But this issue needs further consideration because trees situated on road reserve appear to fall in a somewhat grey legal area. And in my humble opinion locals should be consulted before trees such as Piha’s iconic Pohutukawa are felled.